Tamilnadu Co-optex Recruitment 2017 : Tamilnadu Co-optex Job Vacancy 2017 has announced for 10 Assistant Salesman, Assistant Saleswoman Posts in their official website. We have updated complete information about Tamilnadu Co-optex Recruitment 2017. Now you can check it below. 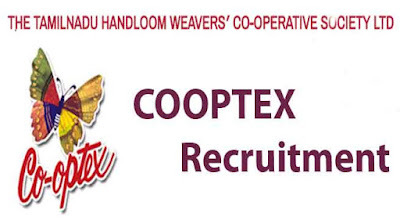 The Tamil Nadu Handloom Weavers' Cooperative Society, popularly known as Co-optex, is a cooperative of traditional handloom weavers of the Indian state of Tamil Nadu. This is under the control of Department of Handlooms, Handicrafts, Textiles and Khadi (Tamil Nadu) of Government of Tamil Nadu. The organisation owns a number of shopping outlets in Tamil Nadu. Co-Optex also has an international arm, Co-optex International which exports its products to Germany, France, Netherlands, Belgium, Spain, Switzerland, Canada, Greece, Hong Kong, U.K. South Africa and the U.A.E. 12th standard (10+2pattern) or its equivalent.